The Rhino Revolver is now offered in a Single Action Only version specifically legal for sale in California. 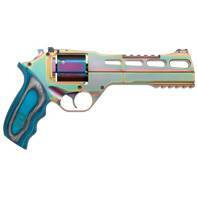 (SAR - Single Action Rhino) The Rhino revolver design features a lower bore axis compared to other revolvers. This means the barrel is directly in line with the shooters hand, wrist and arm. This results in almost no muzzle rise and, because energy is better absorbed and controlled by the entire arm, it reduces the amount of recoil felt by the shooter. In addition, the alignment also gives the shooter a more natural point of aim. Shoot it and feel the difference!